Welcome to the home of the iPodLinux Project (https://sourceforge.net/projects/ipodlinux/)! iPodLinux is an open source venture into porting Linux onto the iPod (https://www.apple.com/ipod/). So far, we have successfully ported a customized uClinux (http://www.uclinux.org) kernel to the iPod, and written a simple user interface for it dubbed podzilla. Additional applications and modules have been written, adding many capabilities not found in Apple's firmware. iPodLinux is currently safe to install on 1st, 2nd, and 3rd generation iPods. 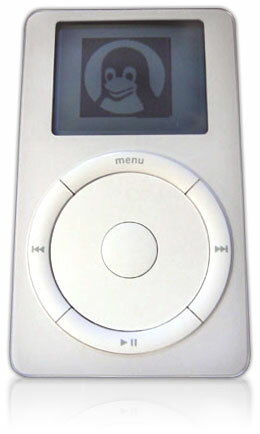 Software Development is currently on-going on later generations of iPod, including the fourth generation click wheel, mini, U2, Photo/Color, Nano, and Video. Donations always help when it comes to supporting new hardware. Progress can be tracked on the Project Status page or the blog (http://www.ipodlinux.org/blog). We are unable to provide support for these newer iPods. Something went wrong? With a little patience, it can be fixed! Button repeat disabled, input wait calculation simplified, no change should be evident. added a beautiful busy spinner. Installation from Windows :: What can I do? Installation from Windows :: iBoy help! Installation from Windows :: Can i set ipodlinux on a pink nano? Find out if your software is ready with the help of software testing company. This page was last modified 17:03, 9 April 2018. This page has been accessed 6386180 times.